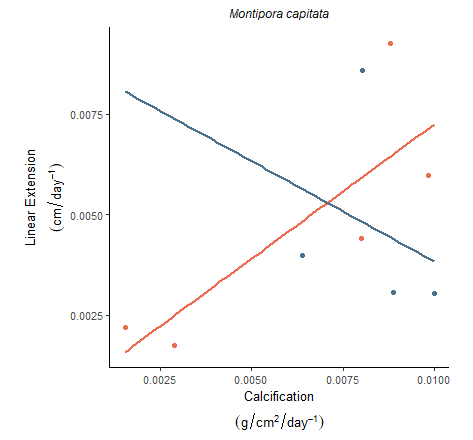 How do you graph two variables from a .csv file as two lines in ggplot2? How to make the benchmark function not to fail if a specific learner fails on a specific task? does anyone know whether it is possible to create the plots integrated in the mlr package for only one of the learners? Looking at the arguments, I don't see the possibility to choose one specific learner - is there any known workaround? If you subset your bmr object to the results of only one learner, it is easily possible. I'm using the visreg package with gg = TRUE (so it'll use ggplot2 graphics) to render my fitted model plots. It automatically uses the names of the independent variable factors as the x axis labels, but I need them to appear slightly differently and tried to change the labels text using scale_x_discrete as can be seen here. But when I do so, the x axis labels, the axis line and its title become blank. I believe I'm failing to map the labels parameter to the breaks parameter. I also get the message "Scale for 'x' is already present. Adding another scale for 'x', which will replace the existing scale." The problem probably lies within how visreg stores the variables (and its levels) information. When using ggplot2 alone, this information can be easily recovered from the used dataset using data$variablename. But by creating the basic plot through visreg this is not so straightforward. Using the variable's levels' names as plotted by default as the breaks. Trying to access the variable levels with fit$xlevels$Species. Guessing visreg could be ascribing integers as the levels and trying to use breaks = c(as.factor("1","2","3")). I have imported a .csv file and have plotted my data points on a line graph. But I am attempting to compare male and female life expectancies, but I can't figure out how to plot one line for males and one for females. Here is an example of part of my data (ALE stands for average life expectancy). This is the code I have thus far. Ultimately I will put my work into a .rmd file. subtitle = "1900-2014", x = "Year", y = "Age at Death"
The issue is I want to have one line for males and one for females to compare the 2 lines on one graph. But the actual result I have is one line on the graph. I am trying to install mlr package in AzureML Experiment, but getting Error, I have the windows binary zip file for the mlr package and its dependencies like ParamHelpers, and connected the zip in a module to Execute R Script, I am getting the following Errors. requestId = 5541aec465e74f3d83b28273a6433ce2 errorComponent=Module. taskStatusCode=400. I need to compare various learners on multiple tasks (> 100 000 hourly temperature records from weather stations) in a benchmark experiment. Because one of my learners may sometimes fails (and it is acceptable) I need a solution (I guess with trycatch() or purrr::possibly()) so that mlr returns, instead of an error for the whole benchmark, NULL for for the incriminated learner of the task on which it failed. Notice that I map the function mlr::benchamrk() to each task rather than passing all the tasks at once. This is precisely because my aim is to get a NULL value when a specific learner failing on a specific task throws an error. But doing so will returns a NULL value for the whole benchmark of my learners on the current task instead of a NULL only for the incriminated learner. So, would you advice me to work with the mlr::benchmark function wrapped by a custom error catching system or to work with the mlr::resample an do some custom code to work with its results ? I want to do a benchmark with different models in mlr via 3 fold cross validation. In every fold i want to do again via a 3 fold cross validation a feature selection for every model and pass the best feature set to the outer cross validation. I noticed that the result of a benchmark in MLR uses always all the features included. How can i extract from a benchmark the features used in every fold and every model and how do i make sure they are really used for the outer Cross Validation fold? I cannot extract the used features and the last line in the code indicates that always all features are used instead the selected one via featureSelection.